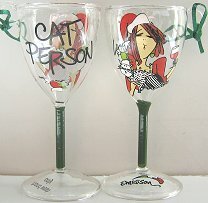 Here is a little hand blown wine glass that is painted on one side with the words "Cat Person". 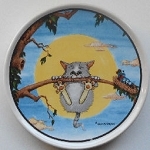 On the other side is the image of a woman holding a cat and a glass of wine. The ornament is 4" high x 2" wide at the top. Green ribbon loop for hanging. Hand wash. Boxed.